The work was performed satisfactorily and I’d use this plumber again. Called about 10:00 AM. I explained my problem. I was told a service man could come that same day – between jobs. The service man arrived around 3:30 PM and completed the work in less than one hour. He was congenial, professional, and did a good job. We were very satisfied with the result and were especially pleased the job was done on the same day we called. 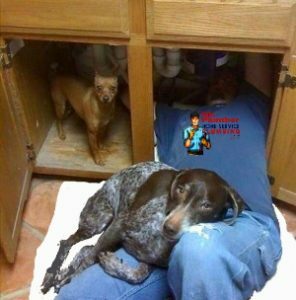 We will definitely use Mr. Plumber Phoenix again. They did drain cleaning and whole house inspection as part of the coupon purchased through this site ($59). They were patient with a number of questions and even made a suggestion of one repair that we could do on our own to save money. They did a full replacement of the cartridges in our master bathroom tub to stop a perpetual leak. We called to make the appointment on a Thursday and expected a long wait to schedule out. They were able to come Friday afternoon. The repairman arrived promptly, acted professionally, and did a full evaluation of the home’s interior plumbing, including answering several questions. He cleaned the master bath drain as included in the pre-purchased coupon and then replaced components of the master bathtub handles that control water flow to eliminate a continual drip. He provided a detailed receipt and did the work for a fair price. Bill spent over 7 hours working (and two days – Saturday and Sunday) on a very tricky copper and PVC combo connection that had burst. This is the second time that I’ve called Mr. Plumber Phoenix and the second time that Bill has worked at my house. I cannot say enough good things about this company. They are prompt, professional, and FAIR. Rather than charging me by the hour, Bill charged by the job…unheard for after-hour, weekend repair. I’ve referred this company to my colleagues and neighbors and everyone has the same experience. After each visit, I feel compelled to write a review because these guys are so good.